The original Sly Fox and One Adult mk 3 below. 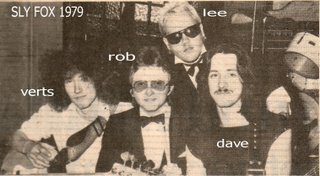 After Gulliver Rob had joined a band called APB unusually featuring two bass players, two Rob Well's and a Pete Wells, none of whom were related. They then modulated into THE SNOOTS featuring dynamic frontman Mick Woodward. When, in Rob's word they left him behind we decided to give this music thing another try. Rob had been hanging out with a friend of his from Batley Art college Lee Walsh aka Lee Valone. We thought he had the ability to sing well and Rob saw in him a potential Mick Woodward. Although reluctant at first, he agreed to be our vocalist. A bass player was sought and lo and behold Simon Verity Mills from Prinz Eugen days brouht along his considerable talents to play bass. We came up with the name SLY FOX. As always Robert and Lee provided some inspired lyrics and music which along with my two penneth gave birth to some excellent original material. 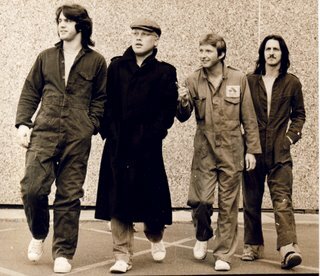 Playing mainly in around Leeds and Bradford we attracted the attention of no other than local Leeds promoter John Keenan. After playing at his F club night at what was then Brannigans on Call Lane he spotted on some of our promotional material, a cinema ticket with the words one adult. He was not keen on our name and suggested that we become ONE ADULT. Being the impressionable youths that we were we accepted the advice and changed our name. Lee Valone - vocals (later to form pop duo ENGLISH EVENINGS). After a few months Simon once again veered off into space and York based bass player the late Bill Berni answered our advert and came on board. In Rob's eyes this was the most creative and innovative version of the band however the strains of travelling from York and our work ethic of rehearsing two or three times a week took its toll and he left after a few months. Sadly a few years later Bill was murdered in his own home in York by one guy and two girls he had befriended at a local pub. They were caught and I believe they are still serving time. TV's calendar program reported Bill as being a loner. Once again adverts were posted and we welcomed Bradford based ex TRAMPUS bass player Chris Bartlett. This was the longest lasting and most succesful line up. Continuing to write excellent songs and playing frenetic gigs, including a couple of mass brawls, we managed to get several excellent reviews in the local pop press, the YEP and Telegraph and Argus.The best of which filled jounalist Nick Keyhoe's Rock On column in the T&A with the headline "One Adult are going to be BIG" The B nW photo above appeared in the YEP. Lee had proved to be an inspirational frontman and we got several prestigious support slots at the Fforde Grene opening for Quartz, Jenny Haan ex Babe Ruth vocalist,Nick Lowe and ex ELO violinist Nick Kaminski. However the highlight in our calendar was always the Sunday lunch spot at the Princeville WMC in Bradford sharing the bill with a stripper. We thought we had made it when after our set the unfortunate stripper got booed off because the audience wanted more of us! Our progression had resulted from the hard work of our friend and manager Mark Wilson and thanks should also go to our roadies Pete and Richard alias Shiny Temple now a very succesful business man in his own right. Full time driver,part-time musician (subject to trade descriptions criteria)and proud father to Alexander.